Ah the second anniversary of someone's death. The biography is a bestseller. The movie with Ashton Kutcher is out. The mourning process is on its natural course. But one more thing has to happen: new action figures. Sure, there may be a model from February, but that was then and this is now. 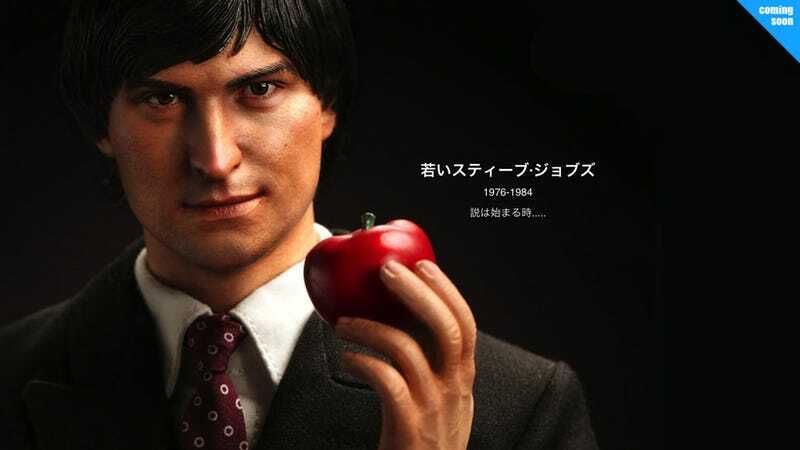 Enter the "Steve Jobs 2nd Anniversary Tribute Action Figures." Tim Cook said in an email to Apple employees on Friday that, "We will continue to honor his memory by dedicating ourselves to the work he loved so much." Which is nice and all. But Legend Toys has the real tribute. 1:6 scale figurines in 1970s Steve, complete with suit and tie, or 1980s Steve rocking the turtleneck and jeans. And if that second option sounds too much like the old action figure, rest assured that the clothes on this new one are made with a superior manufacturing process out of even better quality materials. There's even a laser cut and engraved, antique wood "Apple Computer" for some reason. So there you have it folks. Legend Toys writes, "We think you can feel that we are not just making a commodity, all our artists including sculptor, painter, tailor and all our staffs are working wholeheartedly to recreate our spiritual mentor." You're certainly gonna feel something when you look at these things. Being creeped out and feeling a sense of exploitation is all part of second year mourning, right?